A fantastic men's 8mm court ring made from scratch resistant tungsten carbide with a recessed Greek Key design pattern to the exterior. The Greek Key design is not laser engraved causing just slight shading to the surface as most. This design has actually been carved into the tungsten using a computerised CNC cutter in order to give a 3 dimensional feel to the pattern with the higher section being fully polished whilst the engraved section has a textured finish in order to give a good contrasting effect. As far as we are aware we are the only retailer in the UK selling this particular design. The ring is 8mm wide and 2.4mm deep and is available in UK sizes P to Z+3. The ring has a court profile meaning that it is rounded on the inside as well as outside for a true comfort fit. 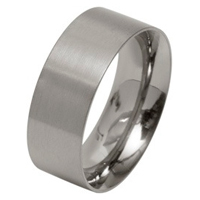 The ring is engraved inside "Tungsten Carbide"